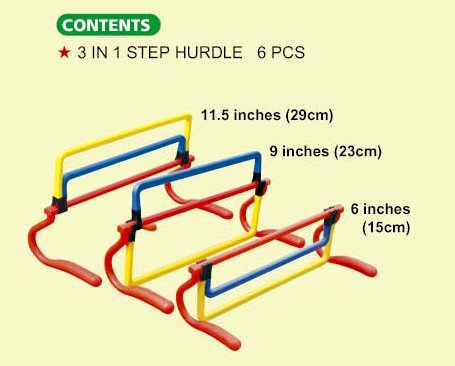 Ideal for young and older athletes to practice hurdle running and training, these safe and adjustable 3 in 1 Step Training Mini Hurdles are a high quality track training aid suitable for a selection of age ranges and are incredibly safe and easy to set up and use. These Training Step Hurdles contain 6 step hurdles, all of which are fully adjustable to be easily and securely heightened or lowered to 3 different heights and are also fantastic for use as a warm up aid for a range of sports. So whether you have a beginner track and field star in your midst or just need adjustable step hurdles for your athletics club, these 3 in 1 Adjustable Step Hurdles are a perfect piece of sporting apparatus to provide runners with a real sense of achievement and motivation.